The last safety tests of the European independent organization EuroNCAP is very important for the global auto manufacturing industry, with no less than 12 models being judged at safety chapter by the best known organization in the world. Among the big names that have their models tested were Volkswagen Golf 6, Renault Megane 3, the new Ford Ka and Fiesta or Volvo XC60, and Dacia Sandero the first proposal of the Romanian car manufacturer. The model that was tested was a Dacia Sandero with a 1.5 dCi engine with frontal airbags for the driver and the passenger. 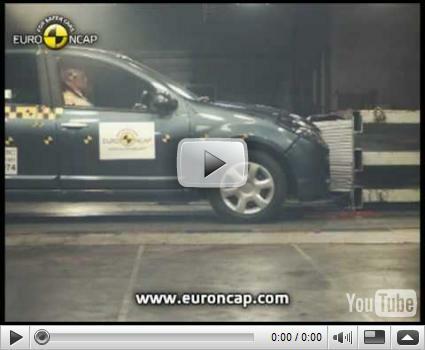 According to the EuroNCAP analysis, the frontal impact reveal a stable car. The heads of the dummys hit in the correct positions the airbags, the major problems are related to some structures in the dashboard that threaten the integrity of the knees and the thighbone of the driver and the passenger on the right. At the side impact, the Sandero suffered because of the lack of an airbag that would improve the EuroNCAP score. In these conditions, the results of the crash tests revealed a car that offers a low level of security in the chest zone. The version with lateral airbags has an improved score, providing superior protection to the head and the chest of the passengers. The Sandero managed to collect four stars out of five for child protection, the result being higher than that achieved by top models in Europe such as Alfa Romeo Mi.To, Peugeot 308 CC or the new Ford Ka. The only inconvenience reported by EuroNCAP engineers was represented by the lack of clear markings on the position of special seats for children and the lack of visual signals, lights and noise from disabling/enabling the airbag on the passenger the right. Sandero managed to score only one star put of four at the pedestrian protection.